The Relief Society, organized under the priesthood and after its pattern, is an essential part of the Church. The Relief Society enables women to act according to their benevolent natures, giving care to those in need. “I attended by request, the Female Relief Society, whose object is the relief of the poor, the destitute, the widow and the orphan, and for the exercise of all benevolent purposes. … There was a very numerous attendance at the organization of the society, and also at the subsequent meetings, of some of our most intelligent, humane, philanthropic and respectable ladies; and we are well assured from a knowledge of those pure principles of benevolence that flow spontaneously from their humane and philanthropic bosoms, that with the resources they will have at command, they will fly to the relief of the stranger; they will pour in oil and wine to the wounded heart of the distressed; they will dry up the tears of the orphan and make the widow’s heart to rejoice. The Relief Society encourages women to practice holiness and to instruct one another. The Relief Society encourages women to follow the example of the Savior in showing mercy and avoiding strife. Read the statement by Emma Smith at the top of page 450. Why do you think Relief Society sisters are able to accomplish extraordinary things? In what ways have you and your family been blessed through the efforts of Relief Society sisters? Read the counsel from Lucy Mack Smith at the bottom of page 450. In what ways do Relief Society sisters follow this counsel today? The Prophet Joseph Smith organized the Relief Society “under the priesthood after the pattern of the priesthood” (page 451). How does this set them apart from other service organizations in the world? (For some examples, see page 451.) Why do you think the Church was “never perfectly organized” until Joseph Smith organized the Relief Society? How do the responsibilities of Relief Society sisters today compare to the assignments the sisters received from Joseph Smith? (For some examples, see pages 451–54.) Read the first full paragraph on page 452. In what ways do opportunities to give service help us become more like the Savior? Read the first paragraph on page 453. What do you think it means to save a soul? In what ways do members of the Relief Society fulfill this responsibility, both temporally and spiritually? Review the second full paragraph on page 452 and the fourth paragraph on page 453. What can Relief Society sisters do to stimulate good works among priesthood holders? What can priesthood holders do to support Relief Society sisters in their work? Read the paragraph that begins at the bottom of page 453. What can we learn from this statement about each sister’s responsibilities and opportunities? The Prophet warned against “feeding on the faults of others” (page 454). What do you think this means? How might this attitude hinder the efforts of the Relief Society—or any quorum or group in the Church? What can we do to feed the Lord’s sheep rather than feed ourselves on their faults? 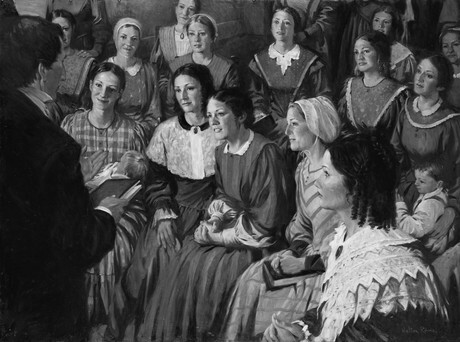 On March 17, 1842, the Prophet Joseph Smith organized the Female Relief Society of Nauvoo. “The Church was never perfectly organized until the women were thus organized,” the Prophet declared. Sarah Granger Kimball, “Auto-biography,” Woman’s Exponent, Sept. 1, 1883, p. 51. Emma Smith, quoted in Relief Society, Minute Book Mar. 1842–Mar. 1844, entry for Mar. 17, 1842, p. 12, reported by Willard Richards, Church Archives, The Church of Jesus Christ of Latter-day Saints, Salt Lake City, Utah. Emma Hale Smith, Blessing, 1844, typescript, Church Archives. Quoted by Polly Angell, in Edward W. Tullidge, The Women of Mormondom (1877), p. 76. Lucy Mack Smith, quoted in Relief Society, Minute Book Mar. 1842–Mar. 1844, entry for Mar. 24, 1842, pp. 18–19, reported by Eliza R. Snow, Church Archives. Quoted in Sarah Granger Kimball, “Auto-biography,” Woman’s Exponent, Sept. 1, 1883, p. 51. History of the Church, 4:567; from “Ladies’ Relief Society,” an editorial published in Times and Seasons, Apr. 1, 1842, p. 743; Joseph Smith was the editor of the periodical. History of the Church, 4:570; from a discourse given by Joseph Smith on Mar. 30, 1842, in Nauvoo, Illinois; reported by Eliza R. Snow. History of the Church, 4:604–5; paragraph divisions altered; from a discourse given by Joseph Smith on Apr. 28, 1842, in Nauvoo, Illinois; reported by Eliza R. Snow; see also appendix, page 562, item 3. Discourse given by Joseph Smith on Apr. 28, 1842, in Nauvoo, Illinois; reported by Eliza R. Snow, in Relief Society, Minute Book Mar. 1842–Mar. 1844, p. 40, Church Archives. History of the Church, 4:605; from a discourse given by Joseph Smith on Apr. 28, 1842, in Nauvoo, Illinois; reported by Eliza R. Snow. History of the Church, 5:20; from a discourse given by Joseph Smith on May 26, 1842, in Nauvoo, Illinois; reported by Eliza R. Snow. Discourse given by Joseph Smith on Mar. 17, 1842, in Nauvoo, Illinois; reported by Willard Richards, in Relief Society, Minute Book Mar. 1842–Mar. 1844, p. 7, Church Archives. History of the Church, 4:567–68; from “Ladies’ Relief Society,” an editorial published in Times and Seasons, Apr. 1, 1842, p. 743; Joseph Smith was the editor of the periodical. History of the Church, 5:25; from a discourse given by Joseph Smith on June 9, 1842, in Nauvoo, Illinois; reported by Eliza R. Snow. Letter from Joseph Smith and other Church leaders to the Nauvoo Relief Society, 1842, Nauvoo, Illinois; in Relief Society, Minute Book Mar. 1842–Mar. 1844, p. 88, Church Archives. History of the Church, 5:141; from a discourse given by Joseph Smith on Aug. 31, 1842, in Nauvoo, Illinois; reported by Eliza R. Snow. Discourse given by Joseph Smith on Mar. 17, 1842, in Nauvoo, Illinois; reported by Willard Richards, in Relief Society, Minute Book Mar. 1842–Mar. 1844, p. 8, Church Archives. History of the Church, 4:604–5; from a discourse given by Joseph Smith on Apr. 28, 1842, in Nauvoo, Illinois; reported by Eliza R. Snow; see also appendix, page 562, item 3. History of the Church, 5:24–25; paragraph divisions altered; from a discourse given by Joseph Smith on June 9, 1842, in Nauvoo, Illinois; reported by Eliza R. Snow. History of the Church, 5:20; from a discourse given by Joseph Smith on May 26, 1842, in Nauvoo, Illinois; reported by Eliza R. Snow; see also appendix, page 562, item 3. History of the Church, 5:140; from a discourse given by Joseph Smith on Aug. 31, 1842, in Nauvoo, Illinois; reported by Eliza R. Snow. Discourse given by Joseph Smith on Mar. 17, 1842, in Nauvoo, Illinois; reported by Willard Richards, in Relief Society, Minute Book Mar. 1842–Mar. 1844, p. 10, Church Archives.